game across a season? When was the last time a closer didn’t get his 20th save until that late in the season? Not since 1972? That’s unbelievable. I had to look up Kubel’s grand slam off Mariano but that was in the 8th with the Twins trailing either 3-1 or 3-2 (I think Mo walked in a run just before that– unbelievable too). I’d watch Keith on Sunday but there might be some Republicans on there– the Mouse Ears Network would require that. 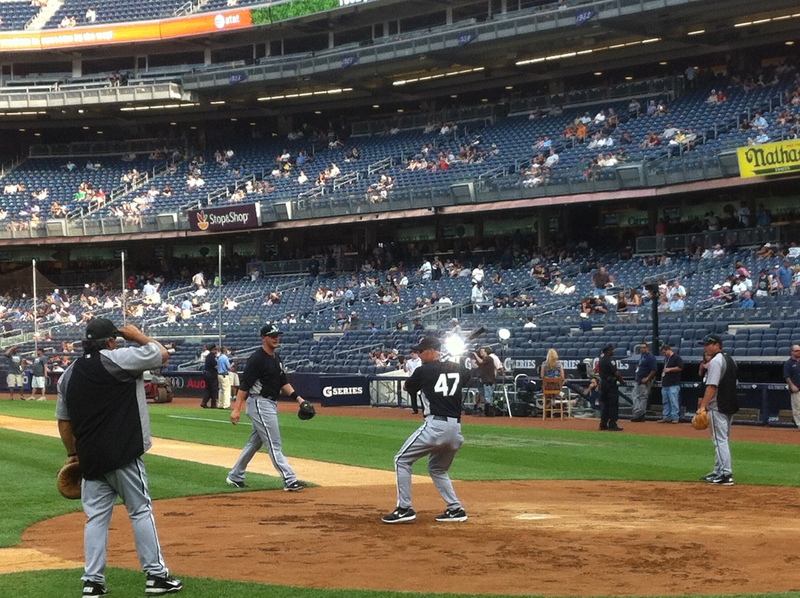 Anyway, I hope the Yankees beat Obama’s team! Good to hear your voice on the clip. Looking forward to seeing you as well. Speaking of comebacks. On this day in 1952, the Cubs played the Reds at Crosley Field. The Cubs were down by 6 runs, 2 out and no on. The Cubs came back to win 9-8 in the ninth. Do you know of any other games like this? I was wondering whether your account of the ’72 game was all from memory. I thought “If so, he’s more than a baseball fan, he’s the freakin’ Rain Man.” Whew. But it took you only FIVE MINUTES to search through your collection of memorabilia (at least the stuff not locked up in storage somewhere) and find that scorecard? My hat is off to you for your organization. 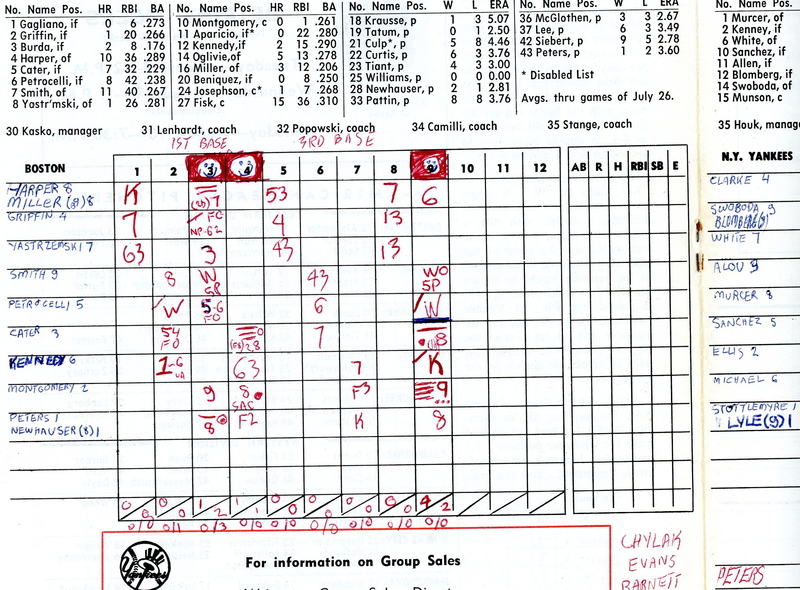 And even at 13, you kept a NEAT scorecard. The “phantom baseball” clip is very cool. Looking forward to seeing you on TV Sunday! Great piece, Keith! I love the addition of the video! Wow! And I am thrilled Youklis is now with the White Sox, even though he was my favorite Red Sox player! (I said he just changed his Sox.) He seems a better fit there. And Truly, he is a dang genius! I am always amazed at his ability to make connections, which defines gifted and talented. Also, I am thrilled about watching THIS WEEK tomorrow morning! What a treat! All the fans will be up early! Thanks, Mr. O! You are the best! You were terrific this morning. I wish we could hear your voice five days a week, again. Keith, they still practice real infield at Larks Park in Hays, Kansas. The Larks are a summer collegiate wooden bat team that has featured stars like Albert Pujols, Lance Berkman, and Jack Wilson. When they go out for infield, it reminds me of the old Terry Cashman song, “Baseball in Ballet.” Come out my way, Keith. I’ll buy you a $2.50 Larksburger and a cold beer in a can and you can watch some great kids readying to be major leaguers. You are right about infield. When I was kid growing up about a mile from Ebbets Field, it cost 60 cents to sit the bleachers. And the seats were prized. You’d get in line about 10 a.m and the gates would open about 11 or 11:30 for a 1:35 game. You got a chance to watch both teams take batting practice and infield. And then, for the same 60 cents, you got to watch the game. It’s never gotten any better that. Yaz had ONE home run at the end of July. On June 18, 1961, the first-year expansion Washington Senators had a 12-5 lead with two out in the ninth in the first game of a doubleheader at Boston…and lost 13-12. Red Sox catcher Jim Pagliaroni tied the game at 12 with a grand slam, and the Bosox followed with two more hits. To add insult to injury, Boston won the nightcap 6-5 as Pagliaroni homered in the 13th. It capped a four-game Bosox sweep, and the Senators — who entered the series 30-30, tied for fourth place and who had a 6-0 lead in the third inning of the series opener on Friday — never recovered, ending at 61-100, tied for ninth with the Kansas City A’s. Is it any wonder Washington fans are pinching themselves over this year’s Nationals? It’s like entering another realm, an alternate universe. Baseball success simply doesn’t happen in D.C.
Its so nice to hear your voice in this clip for the first time. I wish I get to see them playing soon, see you there! It will be really awesome! To visit my blog, kindly cliquez ici . Well Keith glad to see your not unemployed. Figured with your outrageous liberal stances you would go unemployment and blame Bush for your misfortune. Just hope you never again thing your political commentary is worth while. We all know by now, that when you make a habit of connecting with potential customers little and often, on topics that they care about, you increase the likelihood of them doing business with you. might be as simple as “Gourmet appetizers delivered right to your door.